While discussions are underway to extend the lifetime of the $100 billion-plus International Space Station beyond 2020, there is concern about the station's overall usefulness and price tag to operate, so much so the station may face a fiery demise in Earth's atmosphere at the end of the present decade. Also at issue is whether an unraveling of the 15-nation partnership driving the space station program is afoot — a collaboration that is being viewed by cash-strapped countries as too costly and politically a hard-to-sell project. The NAC provides the NASA Administrator with counsel and advice on programs and issues of importance to the U.S. space agency. Five different space organizations — NASA, Russia's Federal Space Agency (Roscosmos) and the space agencies of Europe, Canada and Japan — oversee the space station's daily operations for the many countries involved. There are currently six astronauts living on the station, including three Russians, two Americans and one Italian spaceflyer. They are the 36th crew of the orbiting lab. Construction of the station began in 1998 and is now, nearly 15 years later, largely complete. The first crew, Expedition 1, took up residence in November 2000, and the station has been crewed by rotating teams of astronauts and cosmonauts ever since. Chris Hadfield snapped this shot of a "bullet hole" created by a micrometeoroid or piece of space junk in one of the space station's solar arrays. During the recent meeting, William Gerstenmaier, NASA's Associate Administrator for Human Exploration and Operations Mission Directorate, said space station component failure rates have been less than anticipated. "The hardware is looking pretty good overall," he said. But micrometeoroid and orbital debris hits to the station are still considered "a major risk," Gerstenmaier advised. Such strikes are being monitored closely, with a big survey recently performed to seek out evidence of impacts on the station's exterior hull, he said. Space station survival in 2028 ? Concerning the attitude of the many space station partners about continuing operations through 2028, Gerstenmaier said: "I think this is probably an area where the U.S. is going to have to lead." The international partners "are still looking more for a positive, demonstratable return on investment," he added. For the United States, "we're seeing some benefits from station that the partners have not yet realized. They are doing more traditional kinds of research, in my words. So they are not quite seeing that return on investment. They still see the cost side," Gerstenmaier added. "The cost side is very easy to measure. The benefit side is not so easy to measure." Sam Scimemi, Director of the International Space Station in NASA's Human Exploration and Operations Mission Directorate, also spoke before the NAC committee. Extending the ISS through at least 2028 would mean loads of more research being done and would also prompt added commercial use of the space station, he said. "Part of our mission is to enable a demand-driven market in low-Earth orbit," Scimemi said. In regard to the ISS international partners, Scimemi said: "We have not had serious discussions with the partners to go beyond 2020 as yet. Each one is in a different place." "We’re in a unique situation with each of the other partners. Some are more willing than others … the Canadians, the Japanese, and the Europeans are in a different place — each of them," he said. "It goes to politics in their own countries." Japan, in particular, is struggling with a more severe budget environment, Scimemi said. The country's economic woes were worsened by the earthquake and tsunami that struck Japan in March of 2011, followed by the Fukushima nuclear plant meltdown. From a personal standpoint, Scimemi said his understanding is that the Russians probably want to go beyond 2020. "Obviously, we want all the [station] partners to continue," Scimemi said. "But we couldn't fly the station without the Russians." "We want them all," Scimemi said. "I think we've built something in this partnership … the partnership is more important than the platform itself." It's "something that probably will never come about again," he added. Beyond the hope of keeping all partner nations onboard with the space station effort, using the facility to shoulder crucial research needed for future NASA goals was discussed at the NAC committee gathering. One of the chief questions: Could a human mission to Mars be achieved if the space station were not still in use beyond 2020? "Most likely not," Scimemi responded to a NAC committee member's question. Without extending utilization of the space station and carrying out studies on astronaut health and safety, "there is no way we'll solve all the medical and other human things" to get to Mars, Scimemi said. For one, due to the number of subjects that are slated to live and work on the space station, gathering vital medical data wouldn’t be done until the 2026 time frame. Secondly, initial analysis of Environmental Control and Life Support System (ECLSS) equipment and other crew health gear is headed for a similar target date, Scimemi said. Will the space station have a longer life? The debate over how long to pay for the International Space Station is something that has long loomed over the program, one expert said. "This is a little bit like smoker's cough. It's something that nobody wants to notice," said John Logsdon, professor emeritus of political science and international affairs at George Washington University's Elliott School of International Affairs in Washington, D.C.
An expert in space policy and history, Logsdon said his bottom line is that "the odds, in my view, are heavily against the continuation of the station post 2020." Logsdon told SPACE.com that he did not think it likely that either Japan or Europe have any enthusiasm to pony up money for the ISS after 2020. "That presumes that there’s no major breakthrough," Logsdon said, referring to any potential discovery on the station that turns out to have either great scientific or economic value. Looming in the background of the space station's future beyond 2020 is talk by Russia of starting a second-generation space station on its own, Logsdon said. "And of course you have the Chinese station in the same time period," he added. China has launched two crews to its first space laboratory module, Tiangong 1, and plans to construct a 60-ton space station by 2020. Even given its $100 billion-plus price tag, should anybody care about the International Space Station's ultimate prognosis? "We don't know whether we should care, because the utilization [of the ISS] is really still in its early stages. The station hasn't had a valid chance to demonstrate its research value," Logsdon said. But Logsdon again added the caveat that perhaps the next four or five years can show a remarkable technical breakthrough that shows unequivocally that the orbiting facility is well worth its cost of operations. No doubt, just bringing multiple nations together to create the International Space Station has been a remarkable achievement, he said. "But it has been done. We proved that," he added. 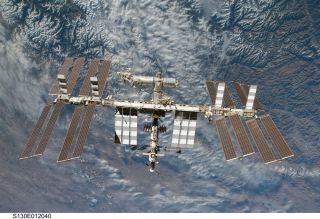 By 2020, the International Space Station will have had nine years of operation after the completion of its primary construction phase, Logsdon said. "So I think we will have proven in those nine years that a consortium of countries can work together to do things in space. I don't think you need the station to continue to prove that over and over." As for taking an abandon-in-place mindset, Logsdon doesn't think the space station partners would agree to just leave the orbiting lab vacant in orbit when they're through. It will have to be de-orbited eventually. "You can't really leave it up there," he said. The judgment ahead is whether the investment in the orbiting outpost was justified in terms of its payoff, Logsdon concluded. "The motto of 'build it and they will come' isn't, as yet, a great success story," he said.